Nobel Prize winner Christian B. Anfinsen, 1990. While Christian Boehmer Anfinsen, Jr. self-effacingly professed that "everyone at Swarthmore was a genius except me," his groundbreaking work in protein chemistry proved otherwise. For his research into why proteins "fold" three-dimensionally, the tall Norwegian-American biochemist received his profession's highest honor in 1972: the Nobel Prize. Born in Monessen, Pa., on March 26, 1916, to Norwegian immigrants, Anfinsen moved with his family to Charleroi and then to Philadelphia. In 1933, he entered the Honors Program at Swarthmore College where he immersed himself in what he called the "natural or exact sciences." 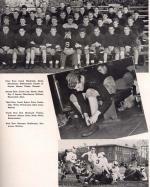 After graduating in 1937, he earned a master's degree in organic chemistry at the University of Pennsylvania (1939) and then enrolled in Harvard Medical School. During World War II, American fighting men were receiving grievous wounds and contracting debilitating diseases, so the nation mobilized its doctors and scientists to find cures for diseases and infections. In 1943, the same year that G. Raymond Rettew's Chester County Mushroom Laboratories became the nation's most consistent producer of life-saving penicillin, the Office of Scientific Research and Development recruited Anfinsen to study the malarial parasite Plasmodium knowlesi, which was ravaging American soldiers in tropical climates. Anfinsen's work soon confirmed that the antibiotic drug sulfanilamide inhibited growth of the parasite. Anfinsen's wartime work studying the metabolism of monkeys' blood fired his interest in the molecular processes of the body. Anfinsen was not alone. More and more scientists were following the lead of scientists such as Sir Frederick Gowland Hopkins, who had won a Nobel Prize in 1929 for his work on how cells extracted energy from food on a molecular level. Linus Pauling, a Cal Tech physical chemist, was using chemistry to understand how molecules arrange themselves. And in the 1940s, British biochemist Frederick Sanger effectively dissected the sequence of amino acids that made up the protein insulin. Following Sanger's breakthroughs, Anfinsen by 1947 had started his own investigation into the chemical composition of proteins and was particularly intrigued by their characteristic three-dimensional shape. What forces were acting upon protein? Were other enzymes causing the folding? These were some of the questions Anfinsen wanted to answer at his new research post at the National Institutes of Health (NIH) in Bethesda, Md. Using a special catalyzing protein found in cow pancreases as his model, Anfinsen and his team watched how the "enzyme" always returned to the same unique arrangement, or what he called its "native conformation." By 1954, he had determined that the native conformation was caused by physical and chemical interactions of the enzyme's amino acids. In the following years he further refined this "thermodynamic hypothesis." Anfinsen's work led to new research and further breakthroughs-and to the Nobel Prize he won in 1972. It inspired new computational methods for determining the hypothetical structure of proteins. His proof that it is possible to create a stable protein by correctly sequencing amino acids helped scientists studying neurodegenerative diseases, including Alzheimer's and Creutzfeldt-Jakob's, that are caused by plaques formed by incorrect protein-folding. In an attempt to publicize his research and urge other scientists to examine the far-reaching importance of proteins, Anfinsen in 1959 published The Molecular Basis of Human Evolution. In it he argued that protein structure was the key to understanding our evolutionary history. Convinced that protein structure was a means of altering human genetics, he in 1968 invited scientists to engage in "molecular engineering" and hoped that by modifying proteins scientists could produce synthetic vaccines. Later in life, Anfinsen also studied the deep-sea bacteria that grow near volcanic vents, which he believed could be used to break down and neutralize toxic waste. Anfinsen also became a self-professed "professional petition and letter signer." Fearful of science's unrestrained manipulation of man and nature, he warned of "giant mice and nuclear bombs." An ardent opponent of intellectual repression, he traveled to Argentina in 1981 to broker the release of twelve scientists confined by military dictator Jorge Rafael Videla. In 1988 he urged Congress not to fund a $300 million Department of Defense request for further biological weapons research. Critical of the human genome project, he urged caution in the field of bioengineering. "I sincerely believe," Anfinsen said in 1983, "that we can maintain adequate surveillance of the application of bioengineering to human beings so long as the human hunger for power and material gain does not become overwhelming." 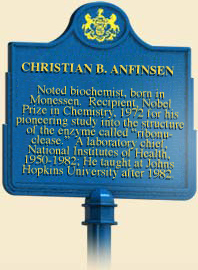 With his reception of the 1972 Nobel Prize for Chemistry, Anfinsen joined an esteemed group of Nobel Prize winners who have trained, taught and researched in Pennsylvania. Biochemist Paul Berg, who received his undergraduate education at Penn State, won the prize in 1980 for mapping the structure and function of DNA. In 1983, physicist Joseph Hooton Taylor, Jr., who was born in Philadelphia and studied at Haverford College, won for his discovery of a new type of pulsar. Born in Pittsburgh and educated at what was then Carnegie Tech, Clifford Shull won a Nobel Prize in1994 prize for work in neutron scattering. 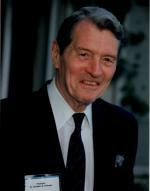 Alan G. MacDiarmid, a professor of chemistry at the University of Pennsylvania since 1954, shared the 2000 prize for work on conductive plastics. Following his departure from NIH in 1982, Anfinsen joined the biology department at Johns Hopkins University. He continued in this position until his death in 1995. Christian B. Anfinsen, The Molecular Basis of Human Evolution (New York: John Wiley and Sons, Inc.), 1959. Jan Witkowski, ed., Inside Story: DNA to RNA to Protein (Cold Spring Harbor, NY: Cold Spring Harbor Laboratory Press), 2005.